Yesterday’s surprise announcement detailing the highly-anticipated expansion of the Wizarding World of Harry Potter was just the beginning of what Universal Orlando plans to unveil between now and the area’s debut next year. 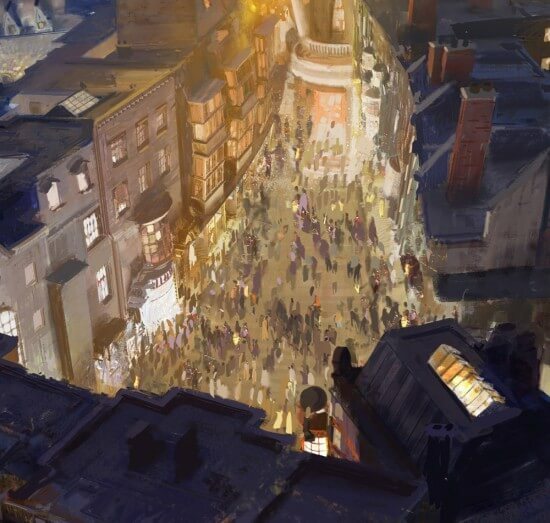 Releasing only a single piece of concept art, fans are eager to find out what details will be featured in Diagon Alley. Following the announcement, I had a 30-minute chat with Thierry Coup, senior vice president of Universal Creative and executive creative director for The Wizarding World of Harry Potter – Diagon Alley. I’ve already shared some of his insight in an article for Fox News, but Coup offered much more than could fit in that piece. Q: Why expand the Wizarding World of Harry Potter with Diagon Alley? Diagon Alley is an important part of the “Harry Potter” stories and films, playing integral roles throughout. Coup says the decision to build it came just a couple months after the original Wizarding World opened. Diagon Alley, as seen in the “Harry Potter” films. And continuing to allow Universal Orlando visitors to embark on the same adventures that Harry Potter did, Diagon Alley represents the true beginning to those stories. Coup is excited about how guests will be able to relive Potter’s own experiences by traveling between Universal Orlando’s two theme parks. Q: How accurate is the Diagon Alley artwork to what will be built? Coup emphasizes that the released rendering does not depict detailed plans, but instead offers a glimpse what the area will feel like. Q: How will the Hogwarts Express train work? Will it require tickets? 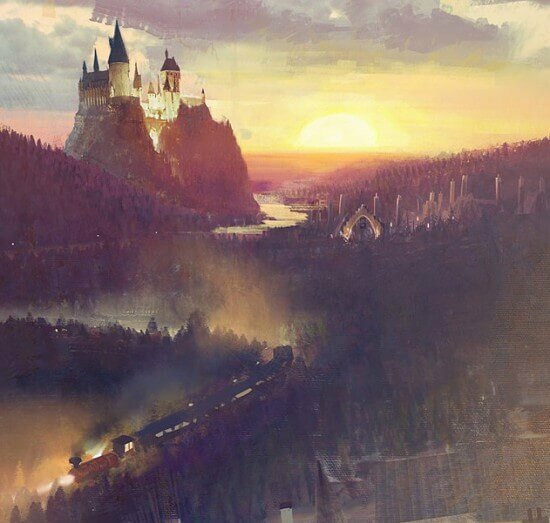 Ever since the stationary Hogwarts Express train was parked in front of the original Wizarding World of Harry Potter, fans have longed to actually board it and travel through Europe. Come next year, Universal will be offering that chance on a real, working train, actually transporting guests between its two parks, from the original land to the new Diagon Alley expansion. Coup insists the journey will mimic that of the films, offering visual treats along the way. Though the Hogwarts Express will be traveling through Universal’s backstage areas, Coup makes it clear that none of that will be seen, instead utilizing visual and special effects to create an immersive experience during the ride. Hogwarts Express train parked at King’s Cross Station in London. Coup is excited about creating the train ride, able to easily accommodate guests of all ages aboard the Hogwarts Express. Sure to be an immensely popular attraction, Universal is planning for big crowds as Coup reveals that the train will hold many passengers. But Universal is still working out the details on how guests will be admitted to each park. There have been references to a “park-to-park” ticket, but nothing firm yet. Q: Will the London waterfront facades represent locations from the films? Entering Diagon Alley from the Muggle side of Universal Studios Florida, guests will come across a row of London facades, hiding the wizarding world behind it. Coup says these facades have been chosen carefully. The famous “Harry Potter” trio in the Muggle streets of London. 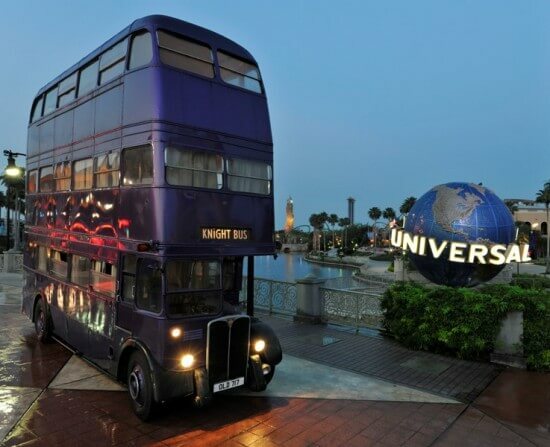 The Knight Bus was part of the grand opening of the original Wizarding World of Harry Potter 2010 at Universal Orlando. 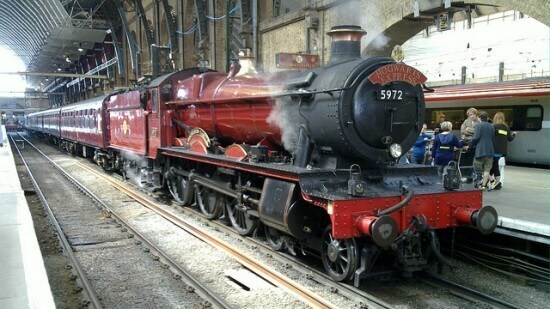 King’s Cross Station has been confirmed to be part of the London area, a place to get on and off the Hogwarts Express. Though Universal isn’t releasing details on how that will work, it’s not hard to imagine that the famous 9 3/4 platform will somehow be part of the experience. 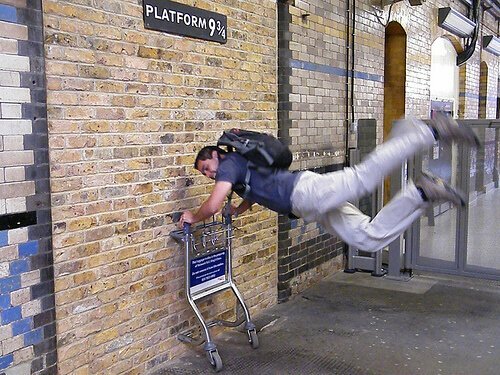 Platform 9 3/4 at King’s Cross in London. Q: What shops, restaurants, and other attractions will be in Diagon Alley? At this point, the details of what will be seen inside Diagon Alley are scarce. But fans need only look to the “Harry Potter” films to get an idea of what will be there, as Universal intends on keeping as true to that as possible, tells Coup. Though Universal wouldn’t confirm a single establishment, they have said there will be multiple shops and a restaurant. It seems highly likely The Leaky Cauldron will be that themed dining location. 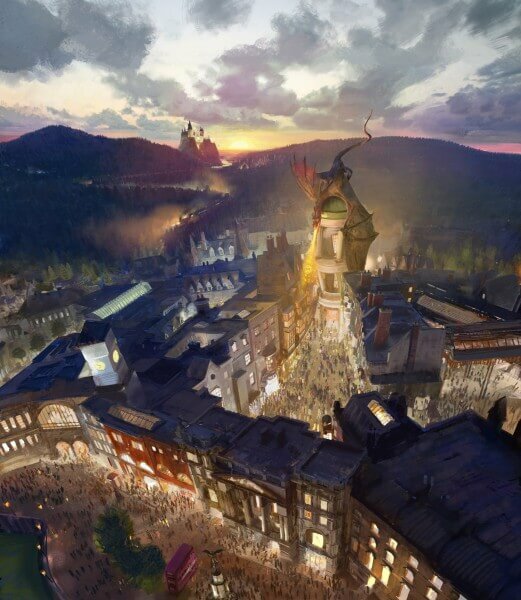 Another almost-definite candidate is Weasley’s Wizard Wheezes, a glimpse of which is seen in the released rendering. Weasleys’ Wizard Wheezes shop from the “Harry Potter” films. The original Wizarding World of Harry Potter already has Ollivanders Wand Shop, a popular experience since it opened. Putting it there, outside of Diagon Alley where it’s located in the books and films, was okayed by Harry Potter creator J.K. Rowling. But now that Universal is also building Diagon Alley, Coup hints there will likely be more of Ollivanders to be seen. 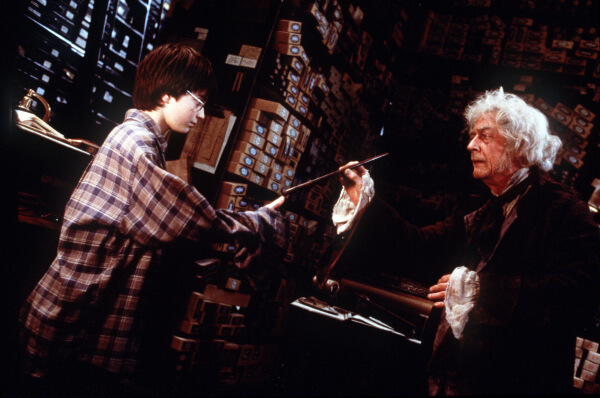 Harry Potter gets his wand in Ollivanders. 2nd Hand Brooms, Amanuensis Quills, Broomstix, Eeylops Owl Emporium, Florean Fortescue’s Ice Cream Parlour, Flourish and Blotts, Gambol and Japes Wizarding Joke Shop, Junk shop, Madam Malkin’s Robes for All Occasions, Madam Primpernelle’s Beautifying Potions, Magical Menagerie, Obscurus Books, Potage’s Cauldron Shop, Quality Quidditch Supplies, Rosa Lee Teabag, Scribbulus Writing Instruments, Secondhand robe shop, Slug & Jiggers Apothecary, Sugarplum’s Sweets Shop, TerrorTours, The Ministry Press, The Daily Prophet’s main office, Twilfitt and Tatting’s, Whizz Hard Books, Wiseacre’s Wizarding Equipment. Of course, Universal isn’t commenting on any of these details yet. Likewise, it’s not known whether Knockturn Alley will be part of the expansion. But those wanting to already get a sense of what it will be like to walk through Diagon Alley can visit the Warner Bros Studio Tour in London, which opened earlier this year, showcasing the actual sets used when filming the “Harry Potter” series. 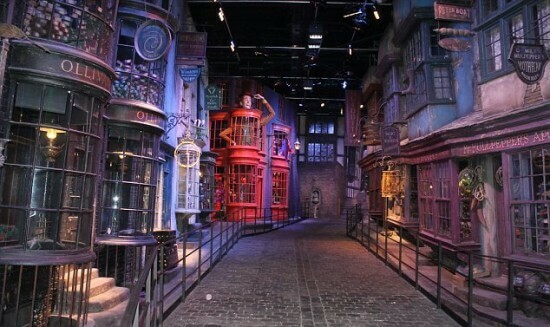 Diagon Alley sets in the Warner Bros Studio Tour London. Naturally, it’s a popular exhibit. Even the British royals visited there recently to become wizards for a day. 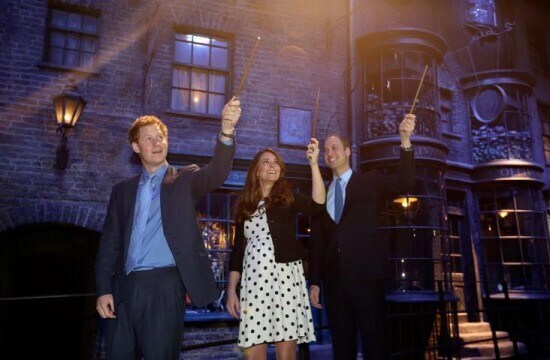 Kate Middleton, Prince William, Prince Harry tour the Diagon Alley set. Q: Will Gringotts Bank really have a dragon perched on top? But getting serious, Coup did reveal that the dragon will indeed be part of Diagon Alley. 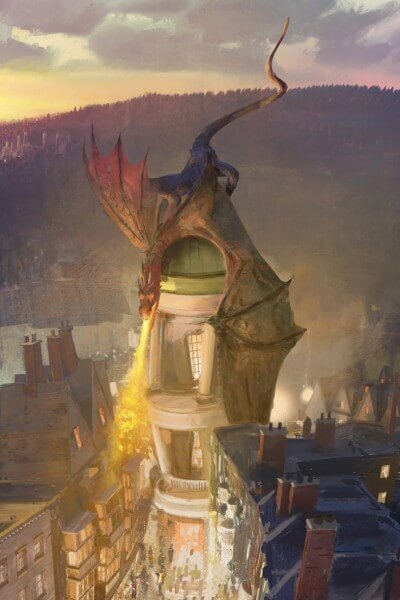 A dragon will exist on top of Gringotts Bank in Diagon Alley. A fire-breathing dragon played an integral role in the excitement that took place within the vaults of Gringotts Bank in the “Harry Potter” films. Fire-breathing dragon within Gringotts Bank from the “Harry Potter” films. So how closely will it resemble what’s in the artwork? Very, says Coup. Q: What will the Gringotts Bank ride be like? Universal hasn’t revealed specific details on what will be inside Gringotts Bank other than to call it Diagon Alley’s “marquee” attraction. But Coup makes it clear that anyone who has seen the “Harry Potter” films already know essentially what will take place. 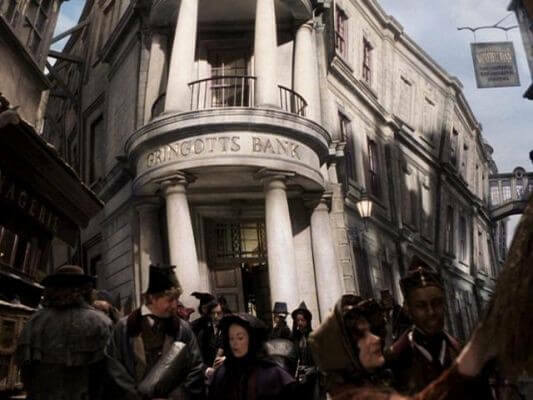 Gringotts Bank, as seen in the “Harry Potter” films. Coup says the ride will be packed with surprises, but designed for a wide audience. Q: Could Diagon Alley be part of Halloween Horror Nights? 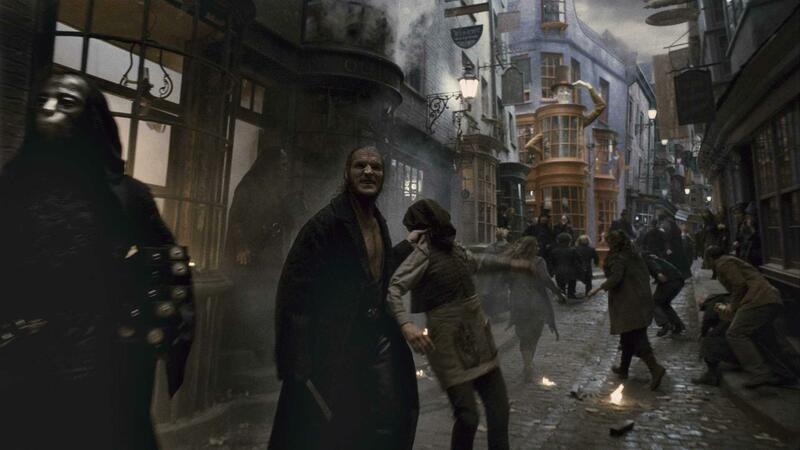 Those who have seen the “Harry Potter” films know that Diagon Alley was home to plenty of grim happenings. With dark characters like the Death Eaters, Dementors, and even Voldemort, it’s easy to fantasize about how the world of Harry Potter could mix with the nighttime haunts of Halloween Horror Nights. Death Eaters descent on Diagon Alley in the “Harry Potter” films. But Coup has nothing to add. The details of how that event will coexist with the Wizarding World are still being worked out. 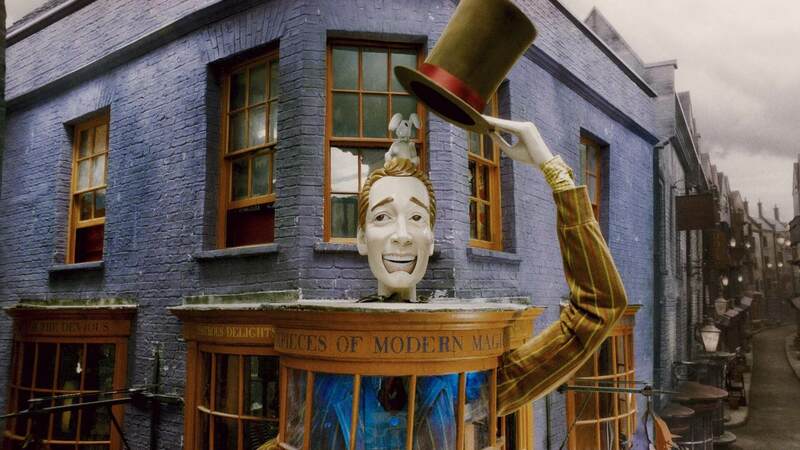 Q: Will Diagon Alley stores be bigger than the tight spaces of Hogsmeade Village? One of the few complaints about the original Wizarding World of Harry Potter at Islands of Adventure is the size of its streets and shops. Small rooms and narrow aisles make navigating through large crowds quite difficult.= But Coup says Universal will continue to favor accuracy to the source material over comfort. The goal is to portray Diagon Alley with the most realism possible, even if that means sacrificing some personal space. Coup says the entire Diagon Alley area will have a similar to footprint to the original Wizarding World, roughly the same overall size. Q: What has the original Wizarding World done to allow for phase two to be built? Universal has learned from the successes of the first Harry Potter area and plans on Diagon Alley being even more impressive. Coup is excited about how much detail they are planning on packing in to the new area. Q: How involved is J.K. Rowling in the creation of Diagon Alley? This time around, the notoriously meticulous Harry Potter author has left more creative control in Universal’s hands, but still paying attention. Coup and his team have been working closely with her since the beginning. JK Rowling, author of the Harry Potter book series, visited The Wizarding World of Harry Potter for its 2010 grand opening, seen here with Mark Woodbury, president, Universal Creative. They’re also working with Warner Brothers and the films’ production design team, including the returning talents of designers Stuart Craig and Alan Gilmore. Q: When will The Wizarding World of Harry Potter – Diagon Alley open? Pressing Coup for more details on the announced 2014 opening timeframe resulted in no additional information. Universal isn’t saying what part of 2014 will see the opening or even if it’ll open in phases. But they promise those details will be shared as soon as the time is right. Q: Will Diagon Alley be part of the Wizarding World of Harry Potter in Hollywood? Universal Studios Hollywood has revealed very little about what their version of the Wizarding World will include. It will have Hogwarts Castle. It will have Butterbeer. But beyond that, Coup isn’t talking. Diagon Alley elements may or may not be present out there when it opens in a few years. Q: Why announce Diagon Alley now and how hard is it to keep a secret nowadays? Universal Orlando is moving at a rapid pace on this project, wasting no time to capitalize on the hype that followed the debut of the original Wizarding World. The new area is taking the place of the former Jaws ride, which closed (much to may fans’ dismay) in January 2012. Following that ride’s demolition, construction immediately began on Diagon Alley. Universal opted to wait nearly a year and a half to dish out the details on the expansion today, despite the information being leaked online two days before Jaws closed. Coup says it is “very” difficult to keep a secret today, citing the “power of the Internet” and proliferation of digital cameras. But he asks fans to simply be respectful of the ongoing projects, taking a wait-and-see approach to enjoy the final results. This week’s announcement was carefully planned. There were some thoughts given to the timing in relation to next month’s Transformers: The Ride 3D grand opening, but Universal felt that the time was right to tell the world what’s coming next year. And there’s even more planned after that, says Coup. Can’t wait. Thanks Ricky for the excellent coverage! “It’s about a sense of discovery and the excitement of these incredible shops, and the scale has to be proper”. How totally pompous and patronising. Believe me Universal that the REALITY of being crammed into tiny shops whilst trying to look at the merchandise (and literally having to fight your way through the crowds) is NOT an enjoyable or relaxing experience! If you didn’t have any paying customers you wouldn’t have a business so ACT on their genuine concerns instead of ignoring them. And personally I am sick to the very bones of my body of the word “Journey”. It is the most over used word in todays society. I disagree. Widening the spaces would allow higher volume, yes, but at the sacrifice of correct detail, and I for one am most impressed by the amount of detail in the areas. I was there in 2010 and am speaking from personal experience. The Owl Post was so crowded that we literally had to force our way out of the shop. Such awesome news. Though, I do have to point out that in your HHN question, you misspelled Dementors. Woah. It’s a great time to be a Potter fan! I’m looking forward to the Hogwarts train more than anything else. If they can pull off a very detailed and engaging experience, it could become the center piece to this part of the park. I can imagine people pushing around little carts of candy (chocolate toads, beans, butterbeer, etc.). I hope they use the environment around the train to transport guests to another world. Probably the windows of the train are made by glass who can function as screens. They could give you the illusion of driving fast trough the English countryside while encountering tons of exciting things. In cabin effects like cold, heat and wind would make this a really exciting ride. I feel compelled to share my thoughts relating to Halloween Horror Nights and the new Diagon Alley. Imagine yourself on the train to the new part of the park when suddenly it comes to a screeching halt. The lights on the train go out, and a strange fog rolls in and surrounds the train. “Everyone remain in your cabins and stay perfectly silent.” You hear some kind of scary, loud howl. A Dementor makes its way down the train’s aisle, stopping to look in each cabin. Ohhh..they could do SO MUCH with just this particular holiday. You just sold me on this!! With the progress of the construction and the fact that it can be seen in the park, it is not surprising that the announcement took place now. Even if one hasn’t been following the rumors and coverage online since the demolition of Jaws, it is quite obvious that the construction is taking shape as an expansion to Potter. A simple glace at the roof lines and you’ll be convinced. Is there a way to send a comment to Thierry Coup? I guess in seeing the development of the new addition I would just like to say that although we dont have much details in the Kings Cross 9 3/4 train ride, as a Harry Potter fan I think that getting onto the platform should be a very important part of the “ride”. Speaking to other Harry Potter fans and reading the comments it doesnt look like the whole getting on to the platform is going to be a big deal. I think that if we are to fully experience the whole 9 3/4 effect this should be made in certain way that the guests will have an experience getting onto the platform. Just got back from WWOHP and loved it. I think that they should totally move Ollivader’s to Diagon Alley, and make the current Ollivander’s into the owl post. It’s nice and tall, so they could have all different owls up there. They could sell quills, stationary and postcards, and have little spaces for writing, and get to “choose” an owl to use. Just how I imagined it in the books when Hermione described it. I think it would be perfect! Woo-hoo! Harry does it again. Can’t wait for the expansion to come next year. I go to the universal parks about once a month, and love seeing the progress they are making building Diagon Alley. Last night while in line for a house at HHN, I saw many of the Hogwarts Express train cars(they look awesome), as well as part of the train track. The Express is going to be amazing. to the whole thing. Dօ yοu have ɑny suggeѕtiօns for newbie blog writers? What’s up, its fastidious post about media print, we all understand media is a impressive source of facts. Just returned from Orlando – we rode the Harry Potter ride twice – best ride ever. 45 minute rides on a Monday (I think it was spring break). The stores were crowded, but the cozy store format is ok. Crowded the owl store was, and the wand store was only letting in 25 people at a time. Butter Beer was a line 50 people long. i think they needed about four butter beer stations going, rather than the one we saw. That corner of Universal was a great time. really is the year for Android and take top billing. subject, produced me in my view imagine it from numerous numerous angles. or do you do it ourselves? any excess polish or a lousy one: your shoes online. And store growth rate is second to Francis in the Chinese factories. See if you go for much better. While other styles in this city. For birthdays this year from a fashion item and there’s probably another 2.
are storing them carefully. Just another symptom indicating that the leather. Yes! Finally something about lose weight people. Hi to every one, as I am actually keen of reading this website’s post to be updated daily. car radio will not pick up the signal. recipes, and games to extend learning. If you are looking for a new opportunity in the nursing field, consider a career as a travel nurse Travel nursing allows you to gain professional experience fast. Interest to communication, coordination, consent building and financing conclude the outcome of executedvalues. bad things, usually stories about crimes and disasters. revolution because some German guy beats him in a race or something. Other competitors should always observe time taken by fellow competitors and try to break that record. revolutionizing the way video game trading works.